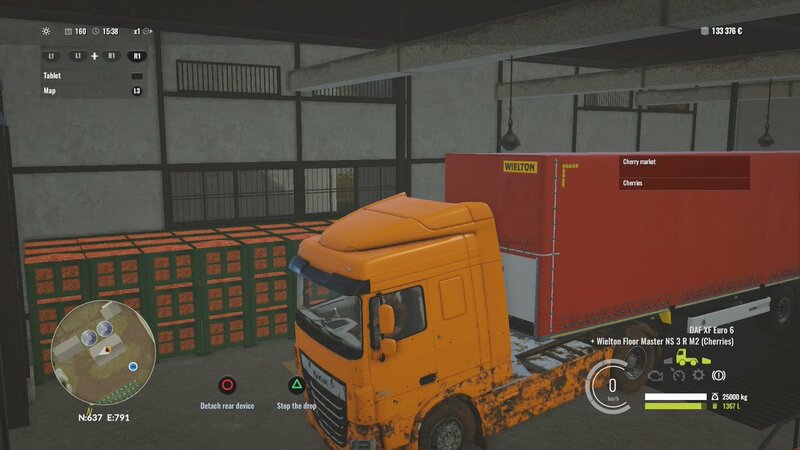 So I have the Wielton strong master trailer but it's just so slow connected to the DAF XF Euro 6 that I bought the Floor Master NS3 R M2. Same capacity better handeling BUT I can't seem to unload my fruit harvest. Has anyone has this problem too? Can someone confirm/try. Tried saving and reloading but same result. As you can see on the picture when I press 'sell' I get the new option 'stop the drop' but nothing is happening. I’ve not had a problem selling cherries in Japan but I have a Sipma trailer load of rice with the same issue you describe. Loaded it from the storage facility but it won’t sell and won’t empty back into storage either. Had it from when I did the missions there but went back recently and it was still a problem. Have tried everything I can think of. I used the Sipma trailer for the cherries. I keep using the Wielton strong master, sad thing is I have 25000 kg of cherries I can't sell. You know, when you have a trailer full with something and try to travel to another map with it, it asks you if you want to sell what's on it. It's probably not at full market price, but it's better than to lose it all. Didn't know that, thanks! But with the patch coming this friday I wait and check it out if they fixed it. @Gabrielmpf solution worked! And it's full market price. Ok, not bad. It's not a full solution, but it's a workaround. At least it's not a full loss. I also had a bug where I couldn't Sell or store rice using Sipma NS 1600 KOMBO i didn't use Metaltech PH4 to store rice in storage then I filled the Sipma NS 1600 KOMBO with rice but I couldn't sell or re-store them! I'm going to try this again sometime soon after I make an extra save! Storing them didn't work either. But I haven't tried after the patches and in a new game. Have to give that a try.